A white smile is a beautiful smile. Nobody wants to see coffee-stained teeth. But while teeth whitening procedures are becoming a dime a dozen these days, not everyone is opting to restore the shine of their teeth using this procedure. This is because one of the disadvantages of using teeth whitening products is tooth sensitivity. Tooth sensitivity, or dentine hypersentivity, is the term given to the condition wherein a person feels extreme pain after biting into something cold, hot or hard. The pain is often described as sharp and sudden, and feels like it radiates from the very root of one’s tooth. The cause of tooth sensitivity is the exposure of the layer of teeth that is found directly beneath the enamel – the dentin. The dentin layer contains thousands of microscopic tubules which all lead to the very heart of the tooth or the pulp region. When the dentin is exposed, stimuli such as hot food or cold air are allowed to travel into the pulp region containing nerve endings which trigger the pain. While the causes of tooth sensitivity vary, teeth whitening substances are implicated. This is why people who have tooth sensitivity are contraindicated from using teeth whitening toothpastes as well as undergoing procedures which may expose their teeth to harsh chemicals that can trigger the pain and accelerate the erosion of enamel. Luckily, those who suffer from tooth sensitivity no longer have to keep sporting stained smiles anymore since a new teeth whitening product has been created that actually helps heal teeth instead of worsening conditions. 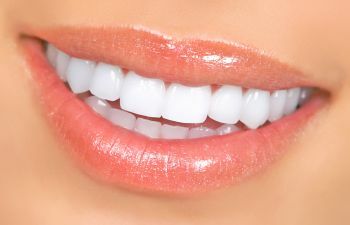 This “white with might” formula was the product of Paffenbarger Research Center (PRC) scientists who have come up with a way to integrating whitening with tooth remineralization agents. Whitening products often cause more harm than good to people with sensitive teeth because they open microscopic pores where food and other stimuli can enter as explained above. While our saliva contains natural minerals which allow our teeth to develop new enamel crystals to shut off these pores, this process happens over a lengthy period of time. But with the “might is white” formula, this process of remineralization is incorporated and rate of development of new dental minerals happens much faster. Best of all, the makers of this special teeth whitening chemical are already thinking of using the formula in the creation of teeth whitening gels, pastes and strips.